On March 2, 1955 a fifteen-year-old high school student named Claudette Colvin was arrested on a bus in Montgomery, Alabama for refusing to give up her seat; this happened nine months prior to Rosa Parks’ famous arrest in the same circumstances. That unprecedented event sent shockwaves through that city which had been the capital of the Confederacy, a bastion of segregation. A group of local activists led by E.D. Nixon -the local chairman of the NAACP – rallied to assist the teenager. The group included a 26 year-old pastor – named Martin Luther King Jr -who had just settled in the Alabama capital. This little-known chapter of the Bus Boycott drama arguably makes Claudette Colvin the Jane the Baptist in the most significant story of transformation in 20th Century America. Colvin was a keen student who had joined the NAACP Youth Council and during that period had been studying about the history of segregation at her high school. Her spontaneous action pulled that community into new territory, unchartered waters. Initially Nixon and the community leaders were able to achieve a tentative ‘resolution’ to the crisis that resulted, through talks with the Police. However, the lawyer of the Bus Company vetoed the interim agreement which would have removed some of the ‘hard edges’ from the segregation practices on the city’s bus system. In the confusion that swirled around this ‘First Take’ there was gossip and fake news sewn – one allegation was that the teen was pregnant. [later found to be untrue] While many grassroots stakeholders in Montgomery were pushing for a major campaign to challenge segregation, in the circumstances, the leadership decided that they were not ready to ‘launch’. Five months later a woman by the name of Mary Louise Smith also refused to follow the policies of segregation on a bus in Montgomery and was arrested. E.D. Nixon and the others again determined that the circumstances were not appropriate for a major challenge to the unjust law. Of course the arrest of Rosa Parks on December 1, 1955 fully launched that movement which has been well documented and publicized. 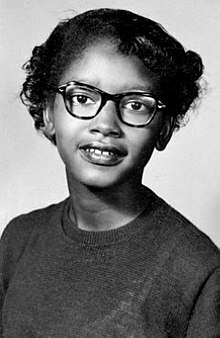 It should be noted that Parks served as the mentor to the local NAACP Youth Council of which Claudette Colvin was a member and she no doubt would have been inspired by the action of the teenager. Rosa Parks had spent a couple of weeks at the Highlander Retreat of Non-Violence learning about civil action through passive resistance; the ‘planets had aligned’ to start the transformation of the most powerful country in the world. Once the Bus Boycott got off to a successful start, it was essential that another front be open through the Courts, challenging the constitutionality of segregation. When the young NAACP lawyer – Fred Gray – looked for witnesses to support the court action, he was only able to find 4 women willing to do so. One of those being Colvin, and her testimony proved to be key, both at the Circuit Level and at the Supreme Court, where the case was eventually won in December of 1956. With the 20/20 benefit of hindsight, it’s clear that the action of Claudette Colvin on March 2nd proved to be a catalyst for what would happen in Montgomery in December of 1955. No doubt the fact that it was a 15 year-old girl, emboldened adults to take their stand, in the face of the type of violent resistance to progress that was endemic in a terror-based society. As we see the forthright stand taken by high school students in Florida in the face of gun violence, over the past few weeks, and yesterday’s powerful presentation by Dellwood Middle School students, we are reminded of the story of the 15 yr-old Claudette Colvin, four decades ago – a child shall lead them. Glenn, thank you abundantly for this clear reminder that Born Bermudians must stand positively firm for their positive belief in self first, in their island home and in the betterment of Bermuda( Bermuda for Bermudians FIRST)! I’m sure you think that changing 60/40 to 40/60 and increasing work permits by 25% is somehow putting “Born Bermudians” first. Yes thank you for talking about Alabama 62 years ago. I think that if you researched Bermuda in 2018 you would find that Born Bermudians of all background and ethnicity get along very well as long as politicians resist the temptation to make race an electioneering issue.